Johanna Barnbeck is a Berlin-based artist, researcher and creative professional offering creative consulting and qualitative research concepts to universities and research institutes. 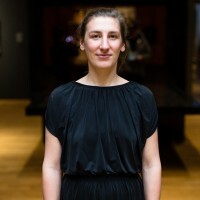 Currently she works on the project "Augmenting Masterpieces" for the Rijksmuseum and the University of Amsterdam, where she investigates human-centered design for digital interfaces in the museum context. Her projects seek to reduce the gap between academic research and creative production, both through methodological refinement and interdisciplinary collaborations.